HydroTops Top Heavy Crop comes in two parts. The first part is in a tablet form, full of microbial elements which latch onto your root system, combining with the rhizosphere. The second component acts as an organic catalyst, which stimulates the microbes (now attached to your root system) into action. This synergy between the two components boosts Brix (sugar) concentrations in the leaves and flowers massively, leading to vastly larger yields with an incredible flavour and aroma to match. Flowering enhancers, boosters and stimulants like PK additives are great for increasing yield, but that's only part of the story. The foundations for the largest possible harvest start with the root system being adequately nourished and the correct nutritional balance at all stages of growth being well catered for prior to the bloom stage. It is with this last point that HydroTops Top Heavy Crop truly comes into its own. The benefits of Top Heavy Crop start when used in the vegetative cycle, where its use increases lateral growth rates, while keeping node lengths to a bare minimum (helping hugely when it comes to flowering, as these nodes will stay dense and tight for flowers too). 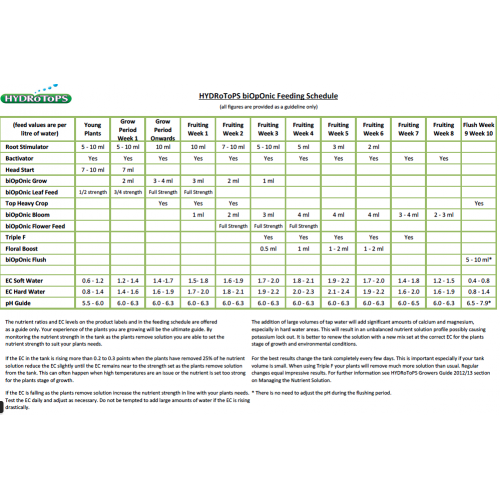 By default, this promotion in growth rate leads to decreased lengths of vegging time required, allowing for more crops to be grown year on year but without a drop-off in overall yields or quality. 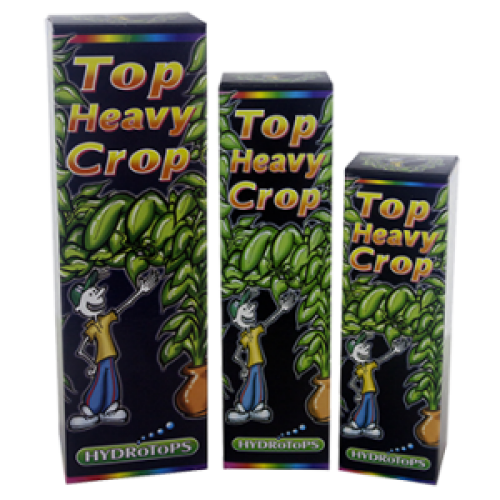 HydroTops Top Heavy Crop can be used from the third week of the vegetation stage until the third week of flower, where HydroTops recommends you begin to use HydroTops Triple F for the final stages of flower. Add once a week with every nutrient reservoir change or with one hand feeding per week. One tablet application treats 50 litres of nutrient feed, along with 25ml of the catalyst liquid per 50 litres of water. Please note: HydroTops Top Heavy Crop is a living product, therefore your adding life to your nutrient tank and root system that can be damaged by the use of hydrogen peroxide products, such as Silver Bullet Roots. Do NOT use such products in your growing system when using HydroTops Top Heavy Crop unless absolutely necessary, as this will severely restrict (or even kill) all bio-activity in your root zone.